Question: I have two kittens, one male and female, both four months old. Even though they are brother and sister will they mate? When is the earliest I can get them neutered? Answer: Yes, males and females will mate even if they are brother and sister. They can be neutered from four months of age or younger. You can find a vet on our early neutering register. Question: I have a female cat that is nearly three years old. She’s had two litters since August last year and I think she is pregnant again… is this bad for her? Answer: It’s a myth that cats should have one litter; there is no evidence to suggest that having one litter of kittens is beneficial. It is not the best thing for your cat to continually have litters of kittens. She will live a far longer, healthier and happier life is she is neutered. Question: How long after giving birth can a cat get spayed? Answer: A cat can be neutered or spayed while still feeding her kittens, however you will need to discuss this with your vet, who may prefer to wait until the kittens are weaned. Either way, do keep her indoors during this time as she can get pregnant again straight away. Question: I want to get our five-month-old kitten spayed. I have heard about money off vouchers you can get to help towards the cost – where do I ask about these and also do you have to be on benefits to be able to receive a voucher? Answer: You do need to be eligible for a voucher but it’s worth calling us as there are lots of reasons why you may be eligible. Phone the neutering helpline on 03000 12 12 12 (option 3) which is open Mon-Fri 9.30am-1pm. Question: My cat is off to be spayed next Tuesday. She is six months old and hasn't yet been outside. How long is recovery and how long will it be until she can go out? Answer: The full recovery will be approximately 10 days. Once she is fully recovered and any stitches have been removed, she will be able to go outside again. Your vet will also give you advice post neutering. If you missed the neutering Q&A don’t worry, you can join in the next one on Friday 31 October at 2pm. Don't forget you can also find general neutering advice on our website. 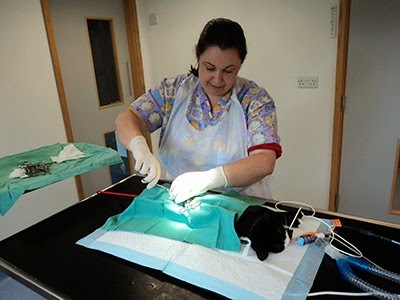 If you require financial assistance with neutering, or help with trap, neuter, return please call our neutering helpline on 03000 12 12 12 (option 3), Mon-Fri, 9.30am-1pm and we can advise what is available for your specific circumstances.